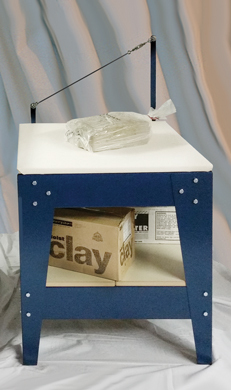 North Star wedging tables provide an ample stable clay wedging surface. 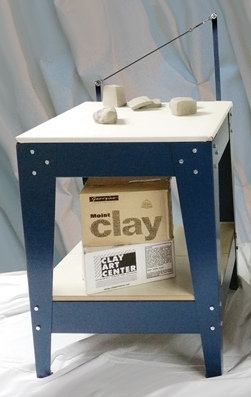 There are many ways to wedge your clay, the cut and slap technique, cone wedging, and also cylinder wedging which are all easily done with these tables. Professional potters have been wedging their clay for years to even out moisture content and to de-air clay, so their beautiful work doesn't crack or explode when fired. These very strong wedging tables provide the perfect wedging surface with storage below. Frame is 14-gauge American steel with baked-on powder coat finish far tougher than any paint. Table tops are made of 3/4" thick maple plywood with a canvas overlay. The canvas is adjustable and easily replaceable with the hook and loop straps. The bottom shelf is made of ?? MEDEX (no formaldehyde) with a high-pressure melamine overlay. Overall dimensions as shown: 28? long, 28? wide, 30" or 36? high. Made in USA. Ships UPS. Wedgit! Table frames are warranted for five years from date of purchase. The warranty does not cover the canvas or clay cutting wire.